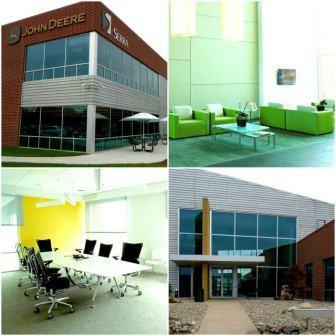 The John Deere Building, located at 2021 South First Street, was completed in September 2006. The modern, brick and metal building offers 52,724 total square feet of space, with upscale interior and exterior finishes. The building features a two story lobby, a Starbucks coffee service, Wi-Fi and a shared conference room with views of the Research Park’s pond and walking paths. Information on space available within this building can be provided by Andrea Ruedi of Fox Development Corporation, 217-239-7514.